My apologies for not posting an Adventure Notebook last week. I'd like to say it was a bit hectic because of GenCon, but in fact the frenzy was caused by deadlines and a tussle with food poisoning. All is back to normal now, more or less. 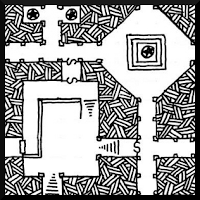 This week's installment is the Frozen Hall of Secrets! I love these maps, mainly because of the quirky pencil sketch style. They are perfect for the short one-evening games I've been running. Thanks! Me too. Wanting to make use of the cool map tiles were a big motivator for doing these short adventures. Is there anywhere to get these tiles? I don't see them on Stonewerks' site. Nevermind - you just need to dig!